Last Friday, I left Bejing with my colleague Dr Fu Jinhe and my wife Bee to travel south to Zhejiang Province, and more specifically to Suichang County, which is the heart of bamboo charcoal production. Suichang is rich in bamboo, with 82% of the territory under forest cover and much of that is bamboo. The total area of bamboo forest is reported to be 233 square kilometres. What impressed me most during the visit was to discover the many uses of bamboo charcoal, and the fact that nothing is wasted in the process. 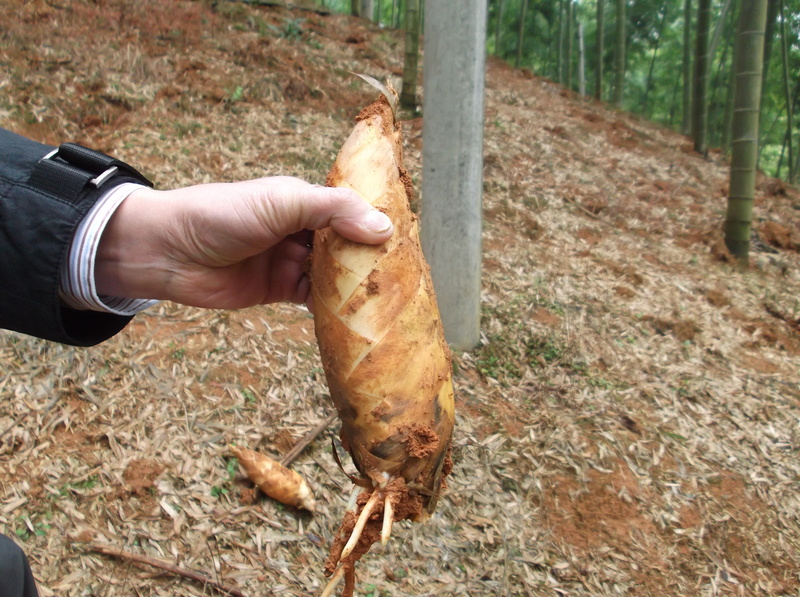 My first encounter with bamboo was with a local farmer who was digging for winter bamboo shoots. Bamboo produces shoots twice per year, and the winter shoots do not appear above ground. Less than 20% survives because of competition for nutrients, and therefore it is actually good to dig up a proportion of the winter shots, thus given the remaining ones more chance to survive. Because winter shoot are difficult to collect, they are valuable, and they taste supposedly very nice. I ate some of the shoots later in the day, and can confirm that they have a lovely slightly nutty taste and they are soft and delicious. In 1995, the Chinese Government imposed restrictions on charcoal produced from wood, and some entrepreneurial individuals in Suichang County started to use bamboo as an alternative source of charcoal. The first attempts reportedly resulted in large piles of ash, but over the years, the process has been honed so that now large quantities of high quality charcoal are produced. The charcoal is mainly traded in the domestic market in China, but the charcoal producer Mr Weng told us that he also sells to Korea and Japan. Bamboo charcoal is made from the waste of other bamboo utilization processes, and the bamboo kiln that I visited had heaps of bamboo cuts that will go into the furnace during the coming days. The bamboo is heated to 900-1000 degrees in a closed kiln, and after a certain period of time the oxygen flow is stopped so the bamboo carbonizes. After one week, the charcoal can be collected. One kiln can produce a tonne of charcoal, and currently a kilo sells for 4 Yuan (0.50 dollars). That is not all, because the steam coming out of the chimney at the top of the kiln is fed into long bamboo poles, and cools so that the liquid flows back down the inside of the poles as vinegar. This is collected in large containers, and provides the raw material to whole range of products, varying from cleaning liquid to preservative. This is not done by Mr Weng, but is the purview of a separate chain of product development. 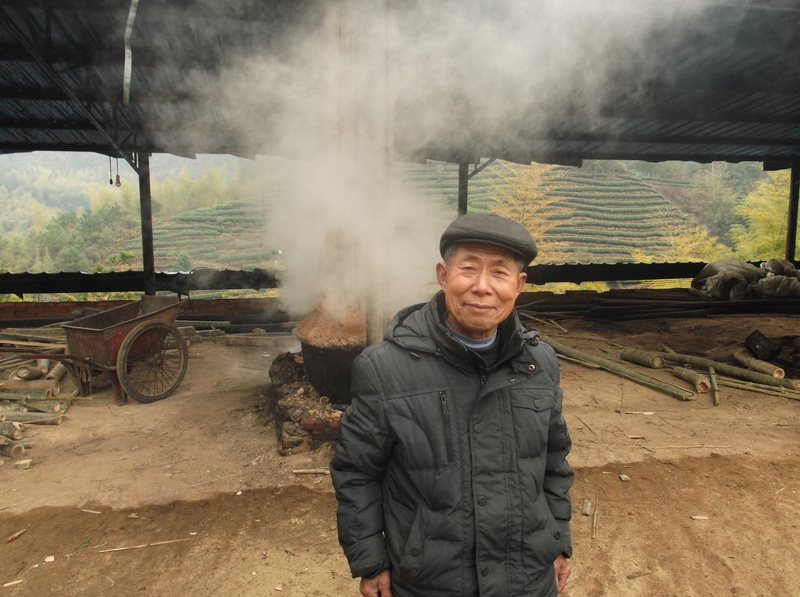 Mr Weng has six kilns in one row and four in another row, and his small enterprise provides employment for 45 people. He is 77 years old but going strong. 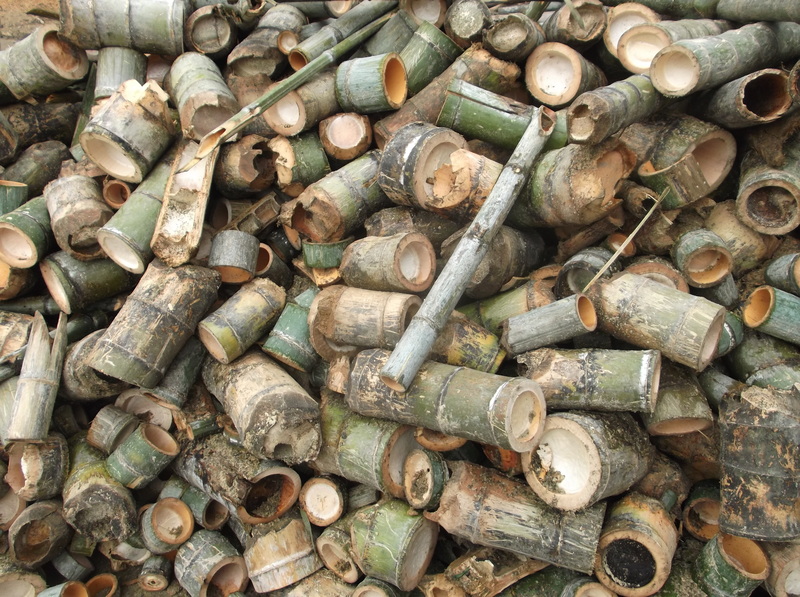 Once the charcoal has been manufactured, there are several subsequent production chains that use bamboo charcoal to produce other high-value goods. Some of the charcoal is developed for general household use purposes, such as fuel or de-humidifying agent and some of it is bagged or put in boxes for use as air freshener. But charcoal powder is also mixed with flour to make charcoal biscuits, the coating for peanuts or black noodles. Charcoal has medicinal properties because its high absorption capacity allows it to absorb stomach acids, so mixing charcoal in with other foodstuff makes it particularly healthy food. I stayed at the Tanyuan Inn, managed by the delightful Mr Chen Wenzhao and his equally lovely wife Mrs Ji, and they produce all kinds of bamboo charcoal food. 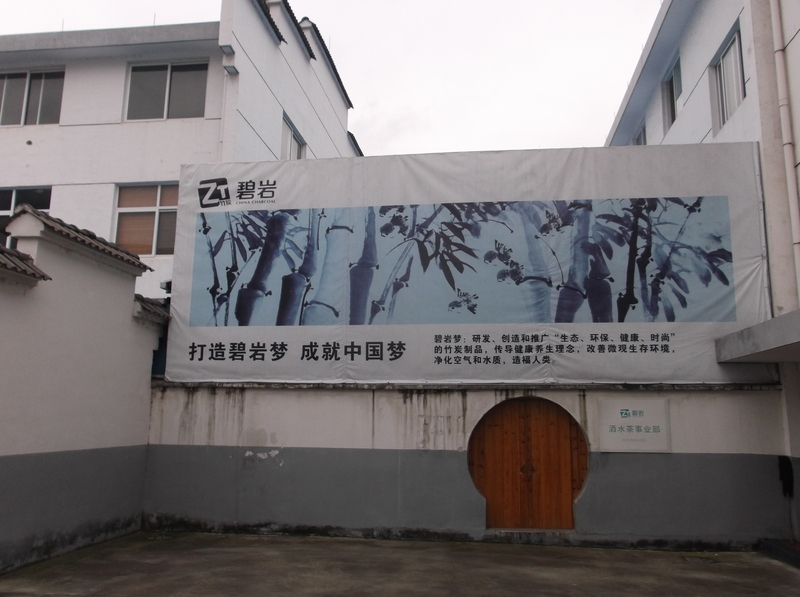 Their shop also sells black bamboo charcoal soap, and they are in charge of the Suichang bamboo charcoal museum. The local government of Suichang County has allocated space to a number of bamboo charcoal companies, in order to promote the development of bamboo charcoal industry. 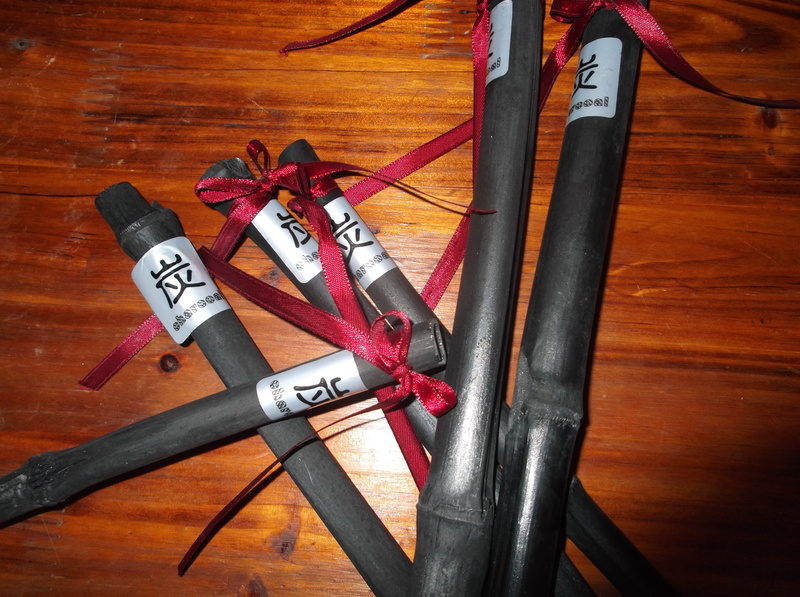 Apparently there are now 54 bamboo charcoal enterprises registered. Finally, the extensive bamboo forests, the production of charcoal and associated activities have created a destination for nature-based tourism. Many visitors from Shanghai, Hangzhou and other nearby towns come to Suichang for entertainment and recreation, especially since the highway was opened 5 years ago. In short: the bamboo charcoal is a valuable primary product, a source for growing innovative secondary production and a catalyst for a booming tourism service industry. This was a very informative and enjoyable visit!